Hemangiopericytomas are rare tumors involving the blood vessels and soft tissue. Hemangiopericytomas may present with epistaxis (nose bleeds), nasal obstruction and facial pain and swelling. However, they are often painless masses and may not have any associated symptoms. These tumors often remain undetected for long periods of time, due the fact that they originate in soft tissue that is flexible and easily makes room for the new mass. These tumors can originate anywhere in the body where there are capillaries. The most common locations reported are the brain, lower extremities, pelvic area, head, and neck. They can either be benign or malignant with the ability to metastasize to other parts of the body, primarily the lungs and bones. Imaging studies will reveal the exact location and size of the mass, as well as the extent of spread. These tumors have a recurrence rate of 41%. The 5-year survival rate is 94% and 10-year survival rate is 72%. Hemangiopercityomas that are located in the nasal cavity and paranasal sinuses, although rare, have a better prognosis because they tend to be less aggressive and do not metastasize. The diagnosis is initially made by imaging including a CT scan and MRI. The MRI will classically show the prominent vascularity of the tumor. Although biopsy is necessary to definitely make a diagnosis, care must be taken given the possibility of significant bleeding at the time of biopsy. Previously, treatment consisted of large open surgeries with extended facial incisions. At specialized centers these tumors can be resected endoscopically without facial incisions. Depending on the amount of blood supply, these tumors can also be embolized preoperatively (a procedure performed by a interventional radiologist to reduce the amount of bleeding during surgery). If they extend into the intracranial cavity often a neurosurgeon is involved in the resection to ensure complete removal of the tumor. Surgery may be followed by radiation therapy to prevent recurrence, usually localized to the postoperative site and particularly in cases where the tumor was not totally removed. Chemotherapy is also effective for treating malignant hemangiopericytomas and is often prescribed after surgery. 59-year-old male who developed bilateral nasal obstruction over a period of a few years. During that time he saw multiple physicians who placed him on nasal sprays as well as steroids, but with little improvement in his symptoms. After a year of worsened right sided unilateral nasal airway obstruction he saw an otolaryngologist who performed an endoscopic biopsy of a sinus lesion found in his right nasal cavity. The initial pathology came back inconclusive but a second biopsy was performed in the operating room and the pathology was suggestive of a hemangiopericytoma. Typically if these are suspected, it is prudent to biopsy them in the operating room as they are very vascular (have a lot of blood vessels) neoplasms. 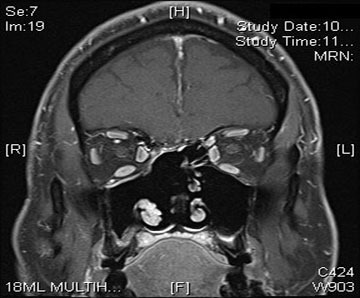 A complete endoscopic resection was performed to remove the skull base tumor that was filling his entire right nasal cavity. He now has yearly follow up visits and performs saline nasal irrigations twice daily. No signs of recurrence have been seen five years post resection. 82-year-old male who reported several months of left sided nasal congestion for which he sought medical attention. It was discovered he had a nasal mass, which was subsequently biopsied and proven to be a hemangiopercytoma. The patient underwent an endoscopic resection of the tumor. 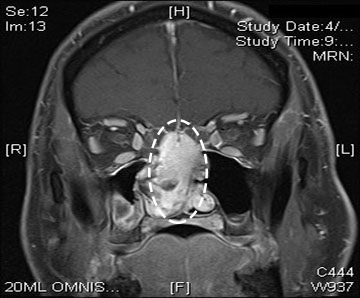 Given the nature of hemangioperyctomas, after complete resection, he underwent radiation therapy. He is one and a half years out from surgery with no evidence of recurrence.